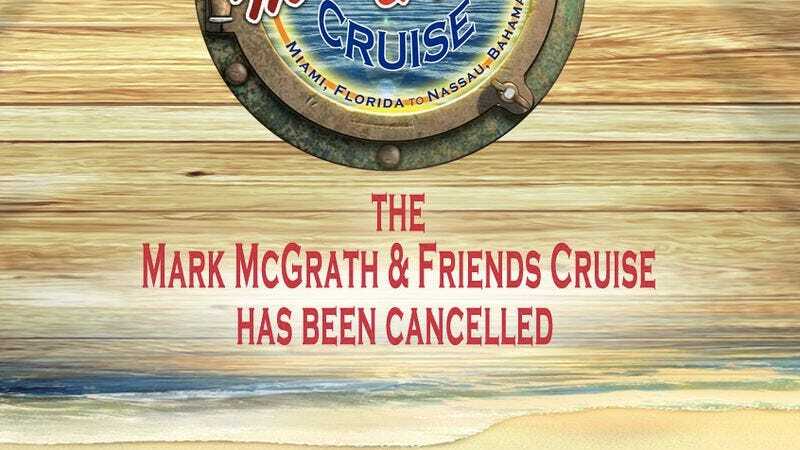 In what will go down as a rare setback for the rising stars of Smash Mouth, the Spin Doctors, et al., the Mark McGrath And Friends Cruise has been canceled before it could ever set sail, consigning its mid-’90s artists to the sort of drydock drifting that does not also include make-your-own-sundae bars. The announcement was made with the usual lyricism one has come to expect from the Sugar Ray frontman, who changed the event’s official website to read, “The Mark McGrath & Friends Cruise Has Been Cancelled” without further elaboration, then set about answering the outcry from disappointed fans on Twitter with an empathetic shrug of “it’s a real bummer”—this in regards to his planned four-day Odyssey, in which the nostalgic siren song of “alternative” radio would have lured sailors to crash, again and again, upon the jagged, gray-dyed-blonde spikes of hard reality, and specifically the fact that now they can’t do that. While some have already suggested that the ticket sales were likely soft, that fans decided unlimited access to Mark McGrath was not worth the $649 even if he promised to keep talking all day, or that there were probably scheduling conflicts preventing the bands from coming together—particularly since Teresa refused to cover the register that weekend—McGrath is pinning all the blame on Carnival and its very public troubles. “That recent cruise fiasco really took us down,” McGrath tweeted, later expanding, “That poop cruise did us no favors.” And though no one has explained exactly how the travails of the Carnival Triumph would affect this other, privately booked cruise scheduled for October, it’s presumed executives saw footage of passengers trapped in stagnation, surrounded by fetid reminders of what they’d once so ravenously digested, and decided they’d have no part in putting people through that again.